Posted by Jenny in photography, travel, wildlife. 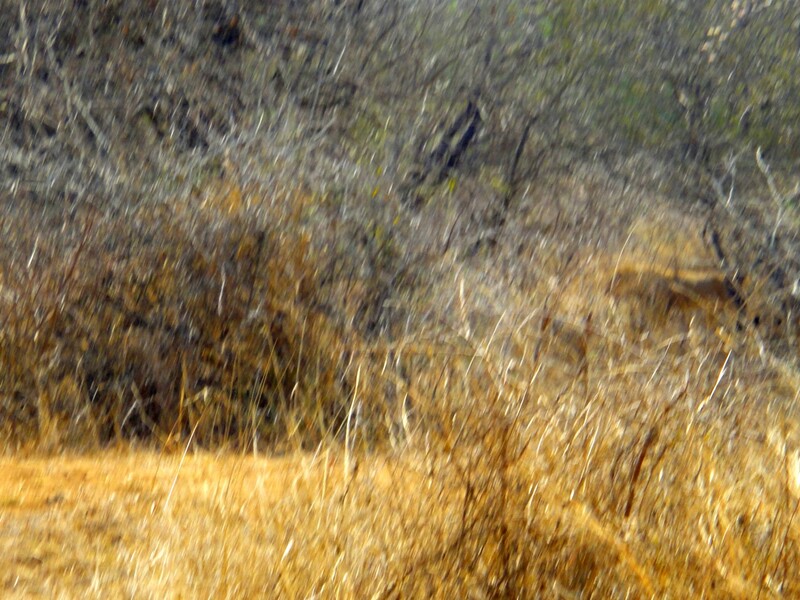 Click twice for full zoom, and you'll see the leopard's eyelashes. Photo by Sonja Myburgh. I described in my last post how I experienced “my wildlife” through my own eyes and through my own lens. It was an experience I would not trade for anything. You, my readers, were very kind about my efforts at wildlife photography. But in this post you will see what wildlife photography is really all about. 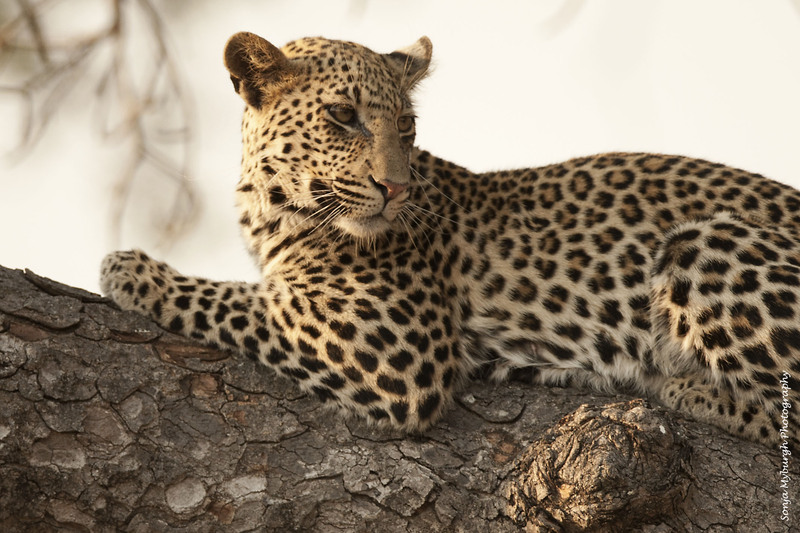 It was one of the several incredibly lucky things about my trip to South Africa that I was in the company of Sonja Myburgh, president of the Bloemfontein Camera Club and a prize-winning photographer. When you look at these photos, you will see why she is considered to be so accomplished. Of course, I could say to myself, “It’s all just the equipment! Give anyone the right camera, and they’ll get the right pictures!” But no, there’s much more to it than that. It’s true that Sonja has a lot of excellent photographic equipment. But knowing how to use the equipment, and having the eye for the composition, is not so simple. With no intention at all to be unduly self-deprecating, I will say that I do not have the aptitude for bringing complex equipment together with the perceptive eye. I don’t worry about it too much—every now and then I get a nice picture—but my talent really lies more with the written word. One of the nice things about getting older is that you stop thinking you have to try to be great at everything—at any rate, I gave up on that a long time ago! I watched Sonja juggling with different lenses and deciding what to use for what kind of shot. One of her cameras was capable of getting off multiple shots in the space of a second—it sounded a bit like a machine gun when she was using it. And I saw her and Arnold working as a team—with him at the wheel of our vehicle, we would patiently go back and forth on the road to get the right angle, sometimes manuevering through a bit of a traffic jam, while she had the big telescopic lens sitting on a special holding device on the top of the partially cranked-down window. At any rate, enough of these words. Let’s have the pictures that are worth far more than a thousand of them apiece. 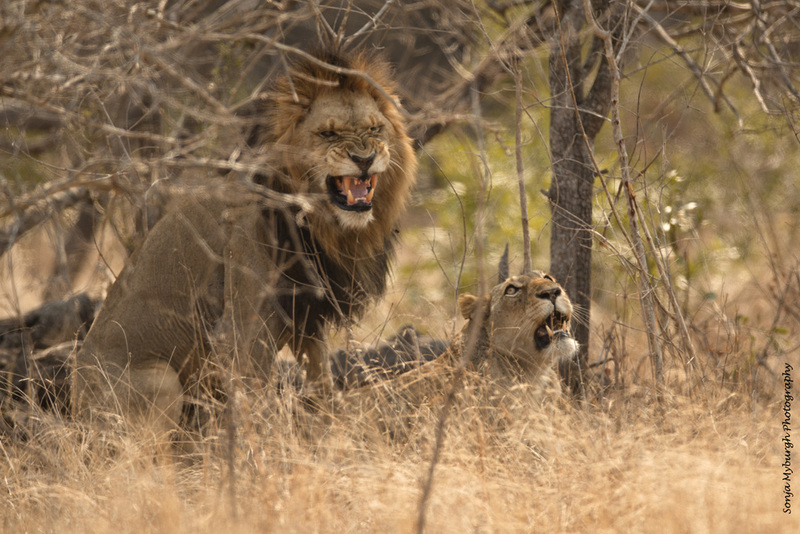 I spoke of the mating lions in the last post. Here they are. I saw that incredible scene through the high-powered binoculars, but I knew it was a waste of time to try with my point-and-shoot camera. 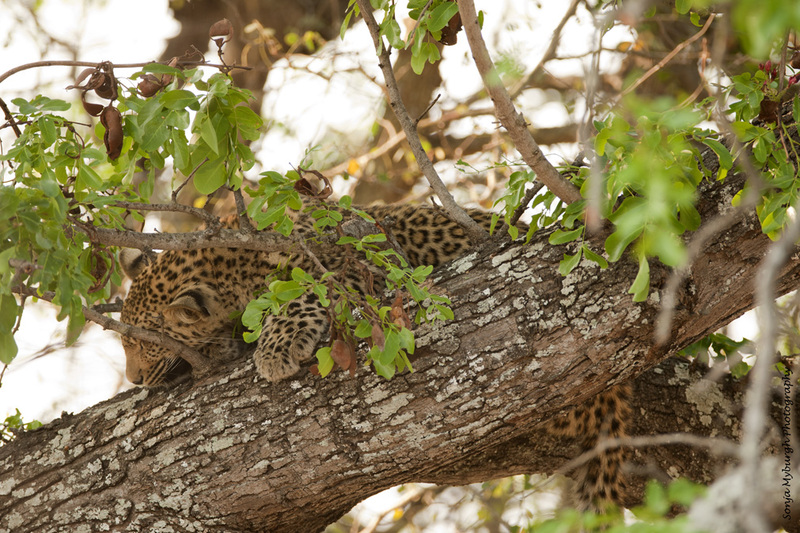 Here are more shots of the leopards we saw. 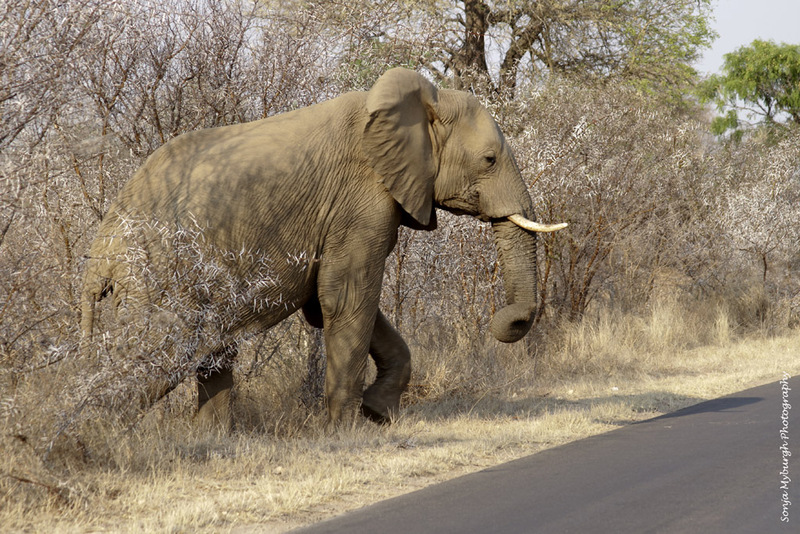 And, last but not least, here is an elephant. Thank you, Sonja—and thank you, Arnold, for making the whole thing possible. Posted by Jenny in memoir, nature, wildlife. 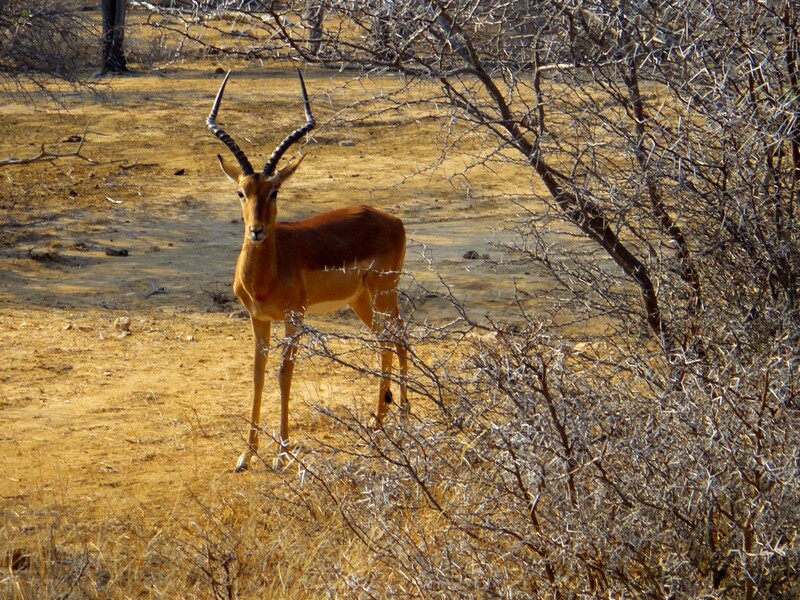 Reedbuck and impala on alert. Click twice on any photo for full zoom. 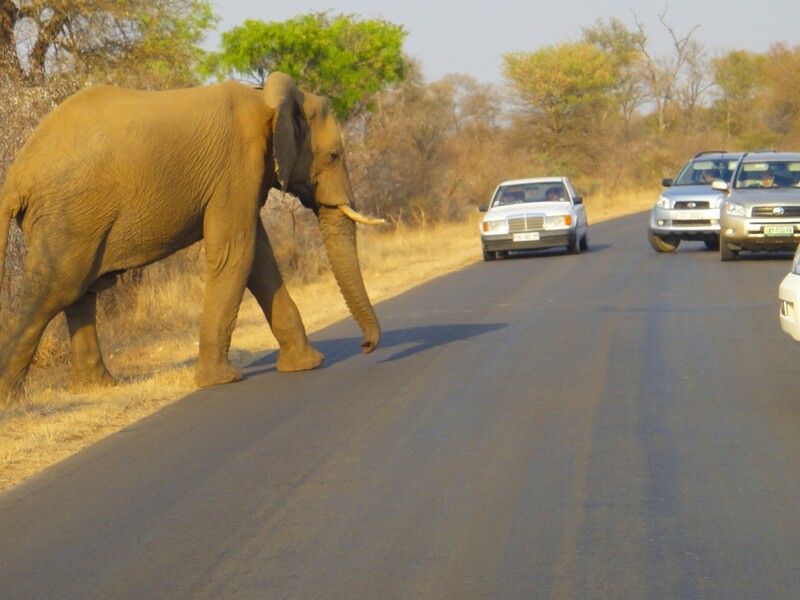 For an introduction about my recent trip to South Africa, go here. 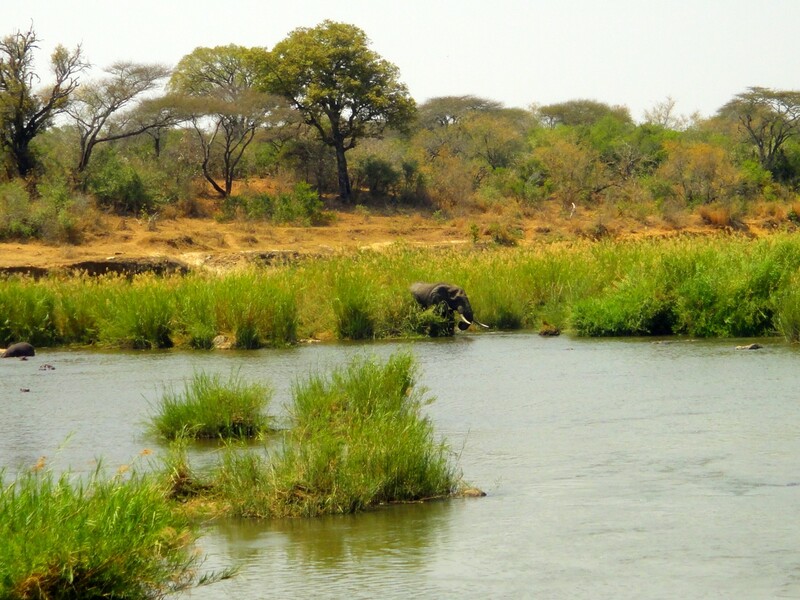 I wrote about elephant in a separate post. Why “my wildlife”? I don’t own these animals, not by a long shot. I have no feeling of ownership about any part of nature. But I chose that title because what you see here is my personal experience of South African wildlife—an experience full of limitations, imperfections, and accidental events, yet one that permanently belongs to me. 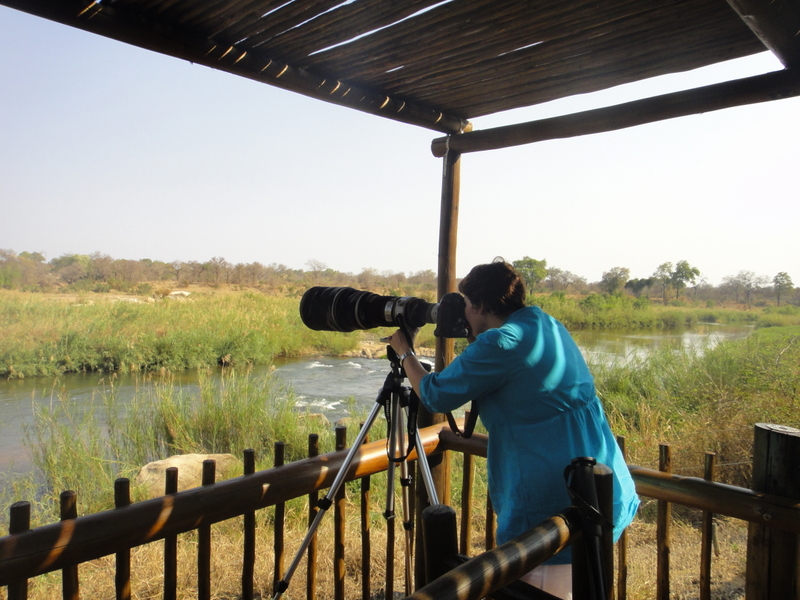 You won’t find any great wildlife photography here, you’ll only see what one person encountered on a few enchanted days, in and around Kruger National Park. I encountered this creature on a morning walk around the Sabiepark Nature Reserve. It looked very comfortable near the parking area. 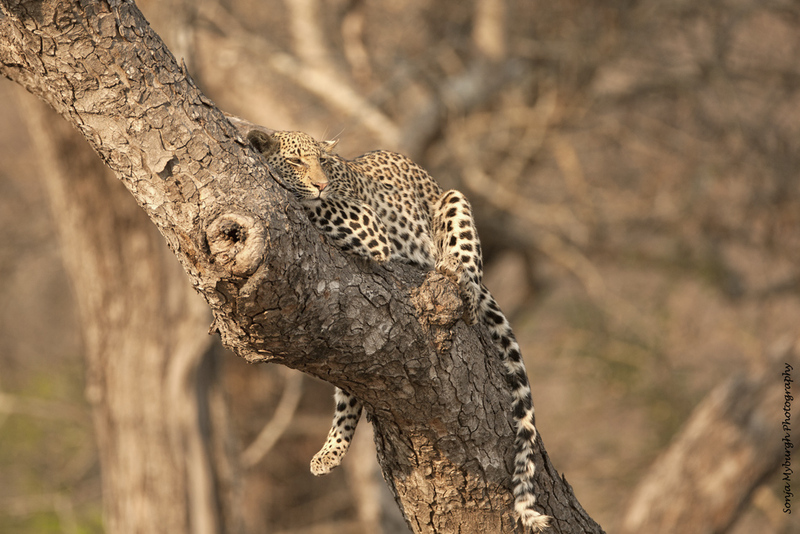 I saw the animal below at Kruger, on our night drive, before it got dark. Arnold tried to pull the wool over my eyes with some story about the males having white stripes on black, and the females having black stripes on white, or maybe it was the other way around. Later that night, we heard the unsettling cries of a hyena as it loped right past the house in the dark hours. We got a glimpse of one in the morning. 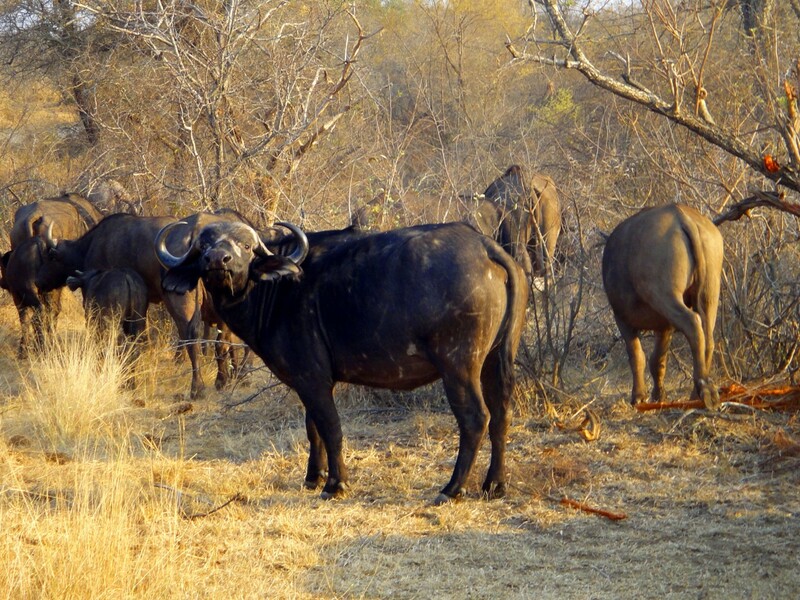 We encountered an ample supply of Cape buffalo. They are one of the most dangerous animals in the park. 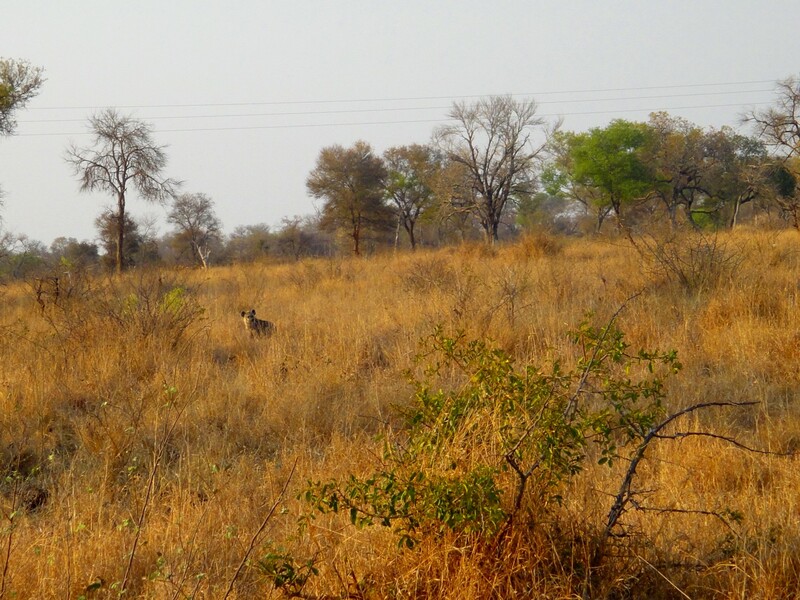 We saw impala everywhere, but I never got tired of them. I liked this little guy up in a tree. 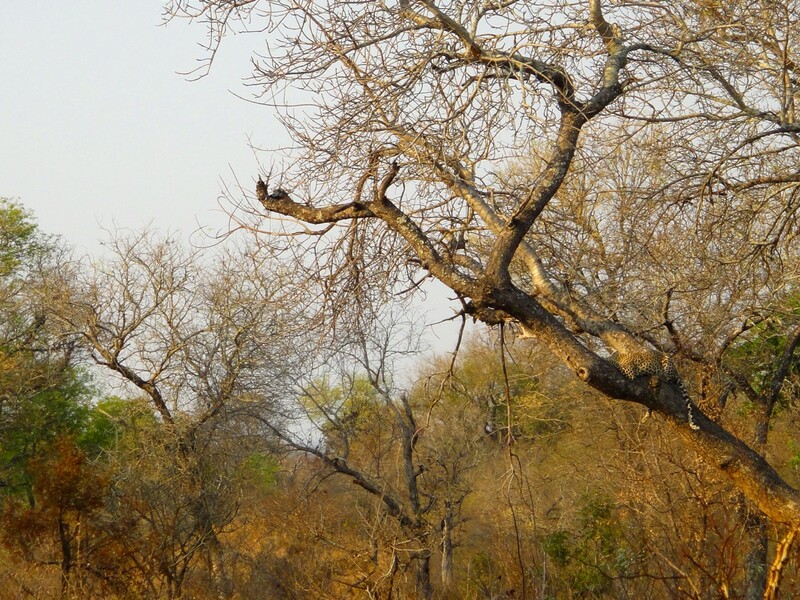 Not long after we crossed paths with an extended family of monkeys, we saw the reedbuck and impala shown at the top of the post. They were wary of something. A little down the road we saw what it was. 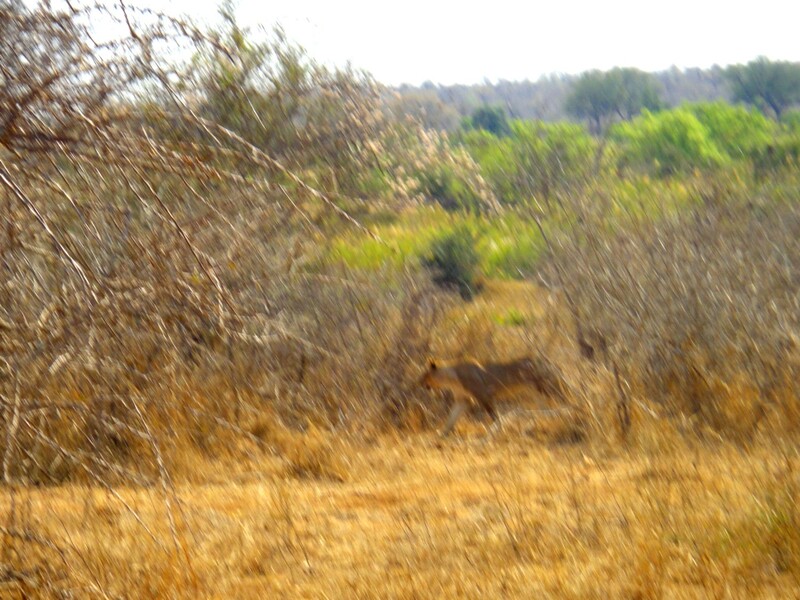 It’s not a great shot, but hey, it probably gives you a better feel for the actual experience of spotting lion than one of those gorgeous, crystal-clear shots you find in places like National Geographic! It was a group—I guess the collective noun is “pride”—of perhaps ten lions that moved stealthily, steadily toward the gathering of impala. It was that particular form of motion, that stalking, that sticks in my memory the best. We picked out first one, then another, then another, all moving in that marvelous fluid way. 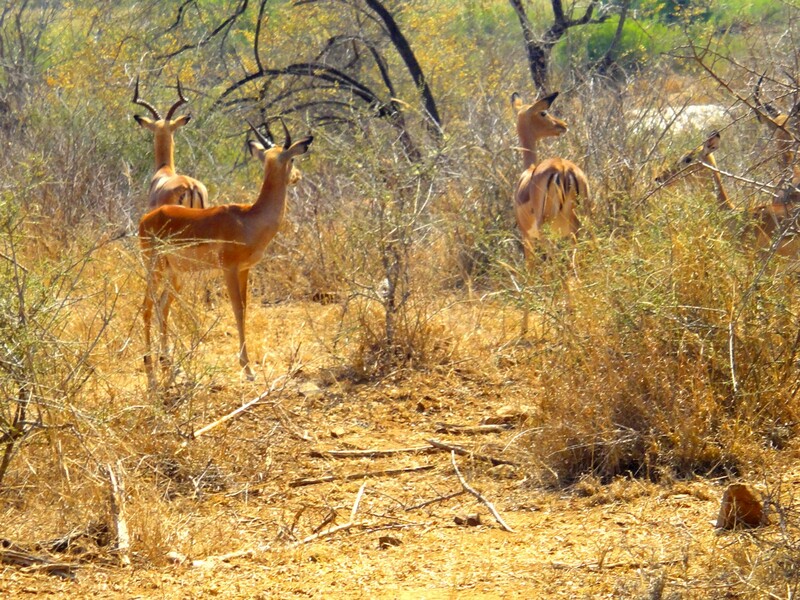 The group of impala made nervous little chirping sounds but stood their ground until the last moment, then successfully bounded away. 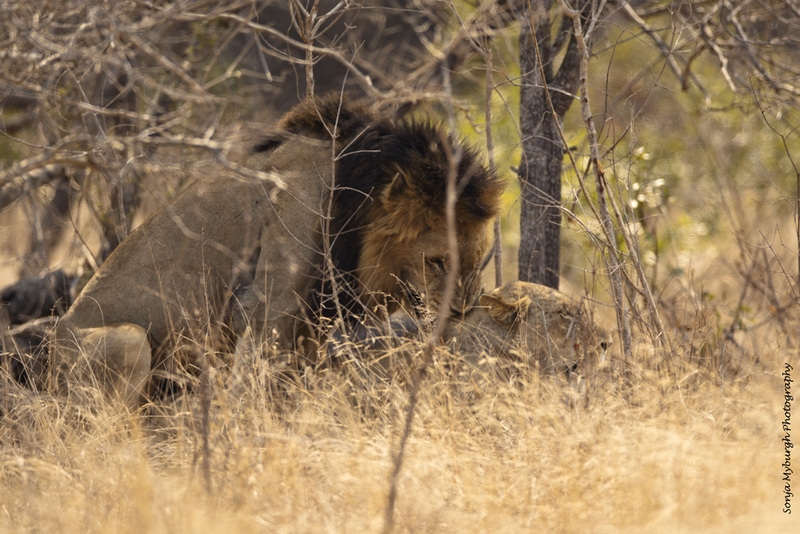 By the way, we had the incredible luck to see a mating pair of lions later in the day. They loll about next to each other for two or three days, rousing themselves every half hour or so to do it again. Quite something. You will have to take my word for it, as I got no photo of it. If Sonja sends me one of hers taken with her giant lens, I will add it here. 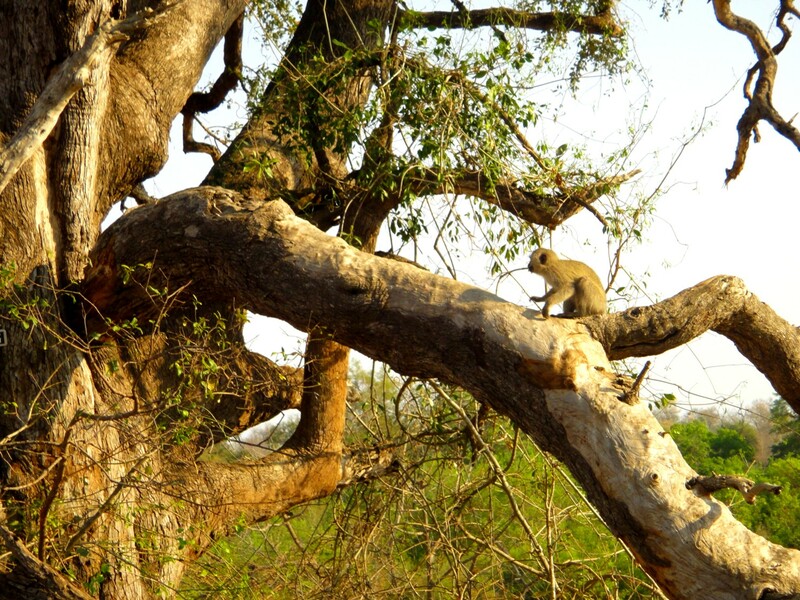 I can only offer, as a very poor consolation prize, my X-rated baboon photo. 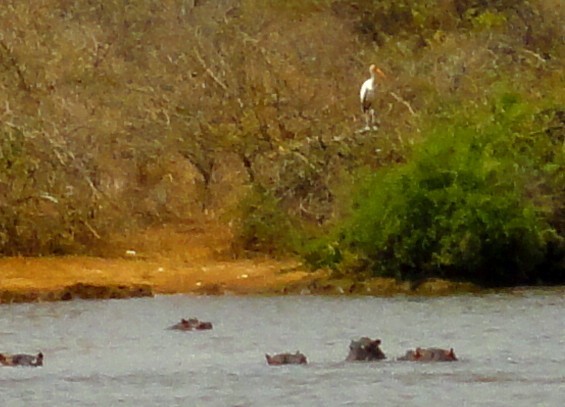 We saw a whole bunch of hippo ears sticking out of a big pond. 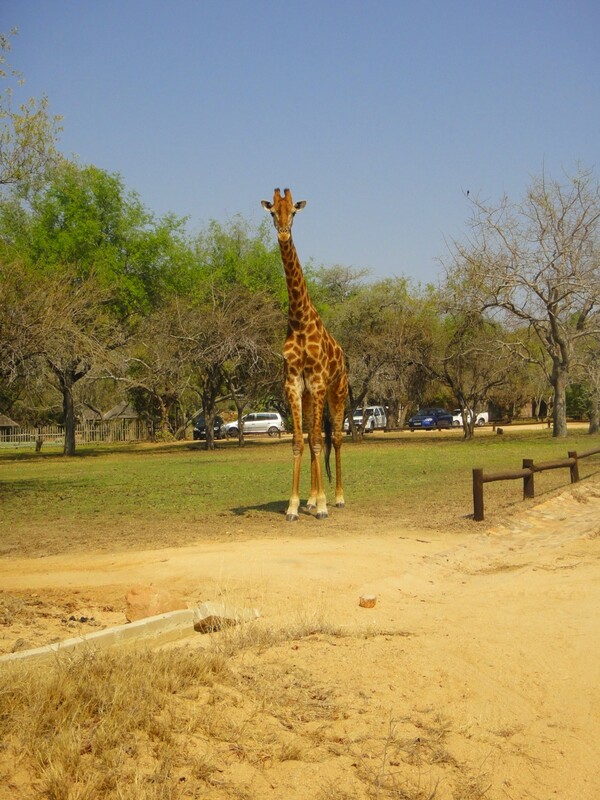 At the Skukuza rest camp, we had some company near our picnic table. 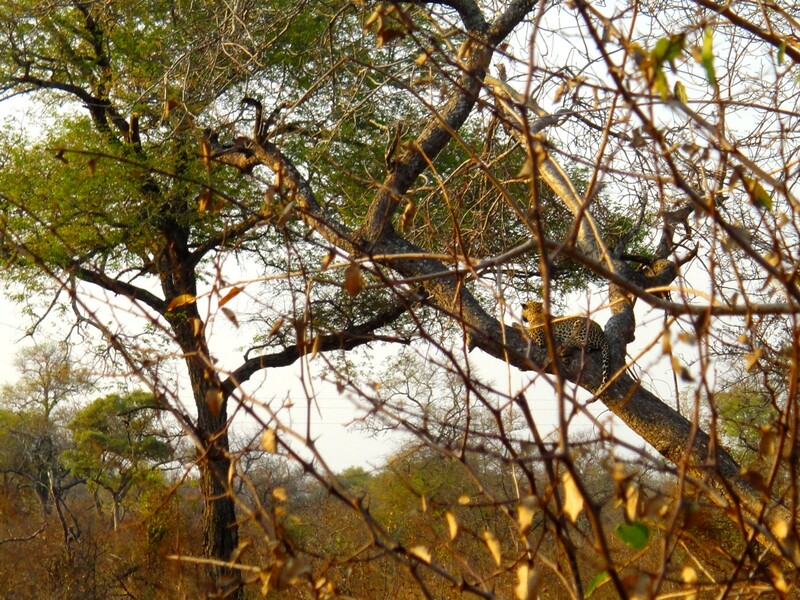 …and its mate in a neighboring tree. 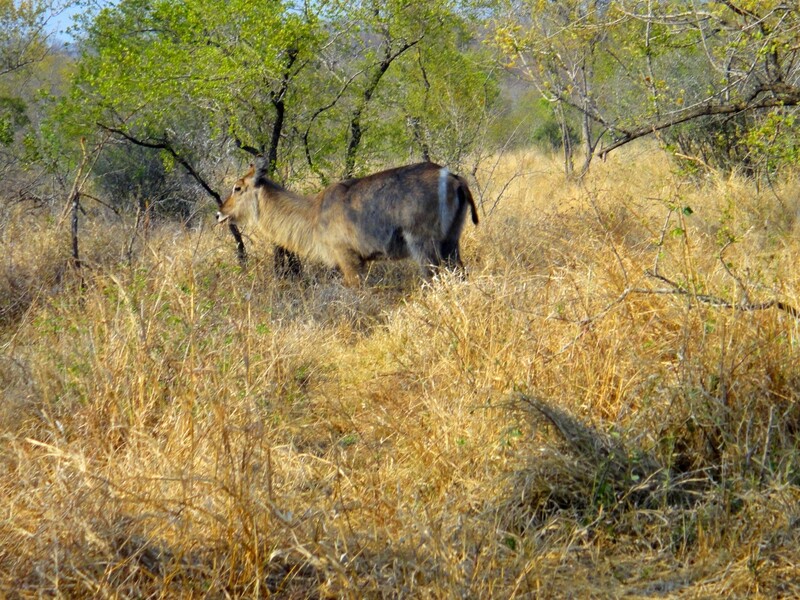 I saw this waterbuck with Klaas and Carol the next morning. 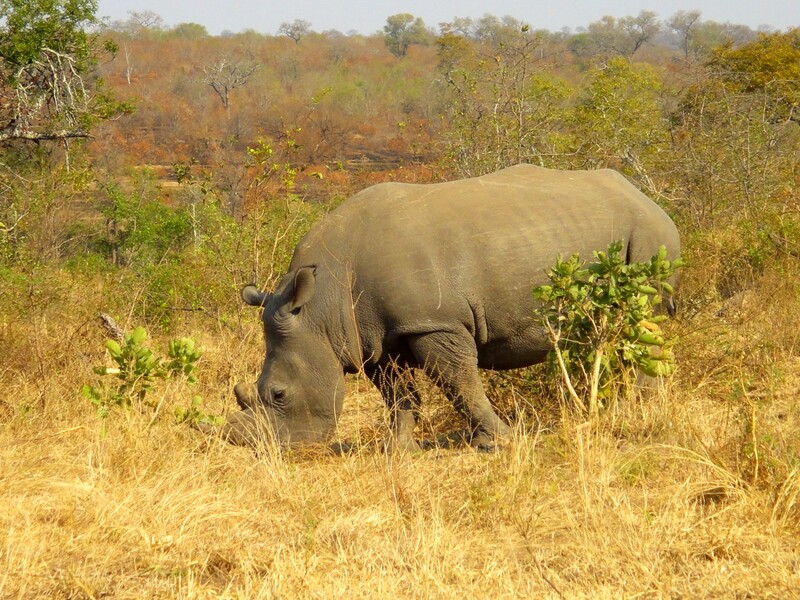 And we encountered several rhino. A few hours after that morning drive, I had to catch a plane and return to reality. P.S. I don’t know where else to put the following anecdote, so I’ll tack it on here. I had completed the Nelspruit-to-Johannesburg leg of my return journey and the killer Johannesburg-to-Atlanta leg, a 16-hour blear-fest for someone like me who can never sleep on planes. On the final Atlanta-to-Asheville leg, I dragged myself onto the tiny aircraft and slumped into my seat. Out came a stewardess who said, “I would like to introduce you to Maggie, our new flight attendant in training. This is her very first flight on the job.” We all spontaneously clapped in cheerful support of the extremely young and slightly nervous-looking Maggie. Then it came time for her to go through the usual blather about fastening seat belts, exit rows, seat backs and tray tables, turning off all portable electronic devices, etc., etc. Reading carefully from her script, Maggie gave it the sort of dramatic pauses and emphasis that you would expect from an actor going through an important audition. Her voice rose and fell in theatrical changes of pitch— she looked up from her card at intervals to make sure we were all gripped with the intensity of the moment—and at last her voice faded gently with the words, “If Captain Busby or any of our flight crew can assist you in any way, please just let us know…” And for that we gave her a well-deserved ovation. Best of luck in your career, Maggie! 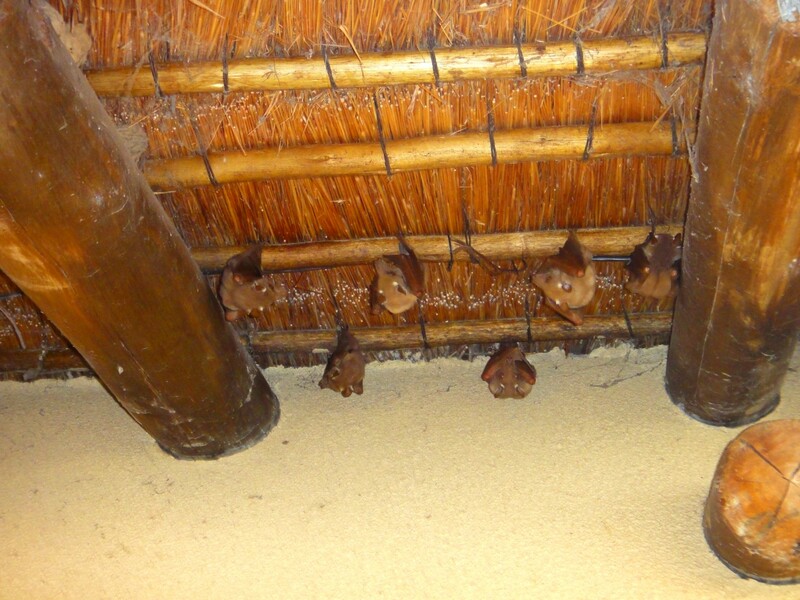 Posted by Jenny in memoir, nature, travel, wildlife. My title for this post is “Elephant” (singular), not “Elephants” (plural). But surely I didn’t see just one? I’m only following the example of my friends Arnold and Sonja, Klaas and Carol. 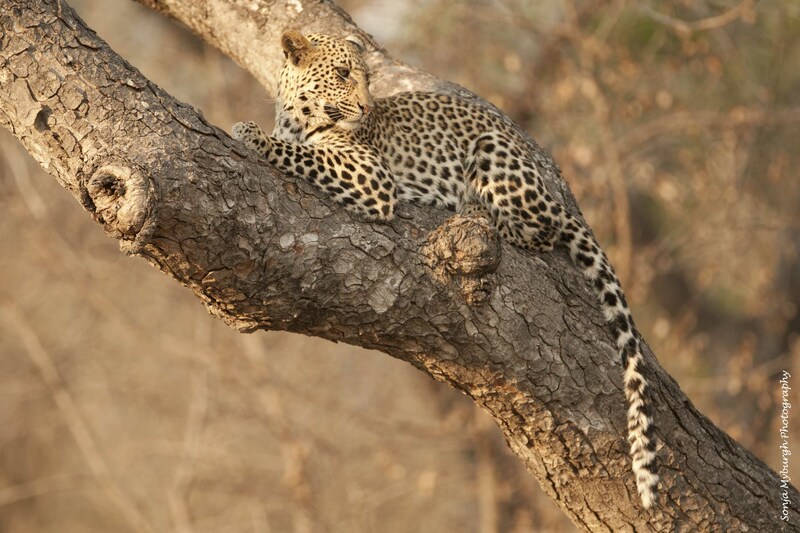 “If we go at dusk, we may see leopard,” one of them would say, or “The dam is a good place to see hippo.” I don’t even remember what the grammatical term is, but the word is being used as an abstraction, a concept, an essence. 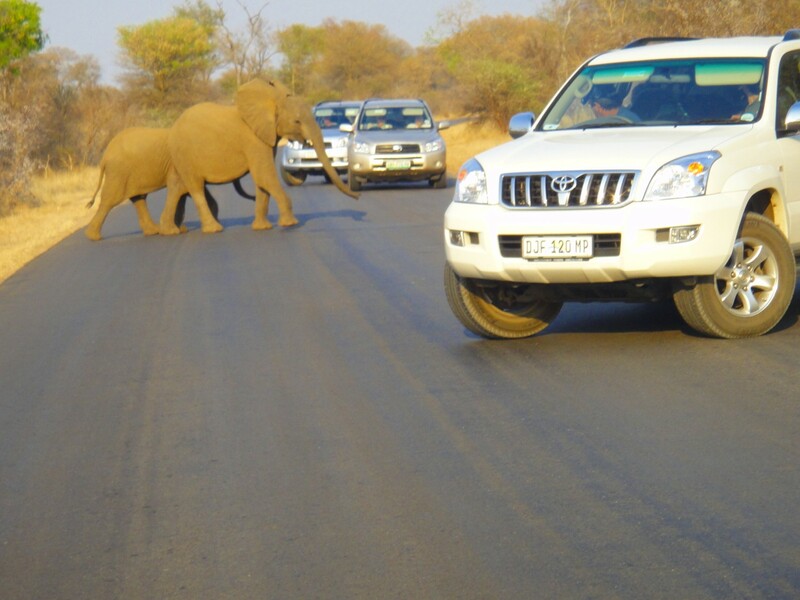 “We will see laziness there” instead of “We will see lazy individuals there.” And, around Kruger, I definitely experienced elephant! 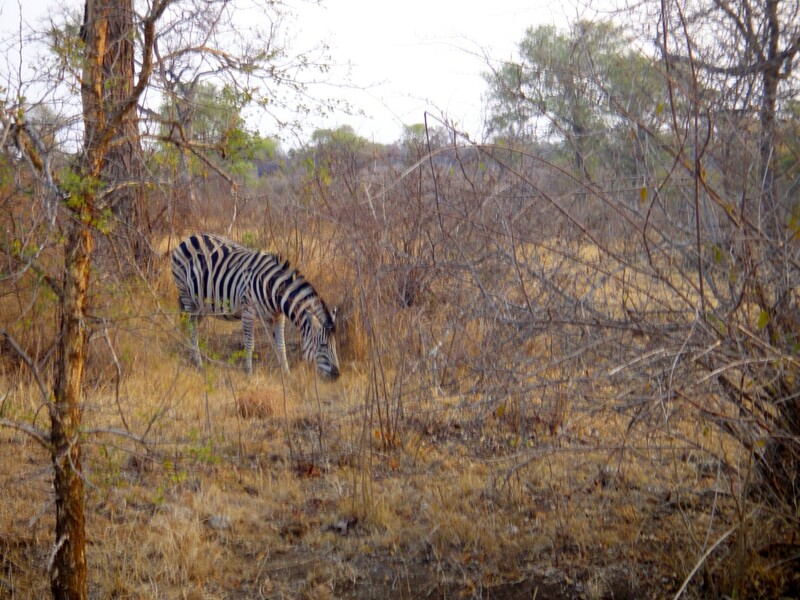 For me, visiting Kruger was a truly magical experience of seeing the animals that I had read about, dreamed about, as a child. 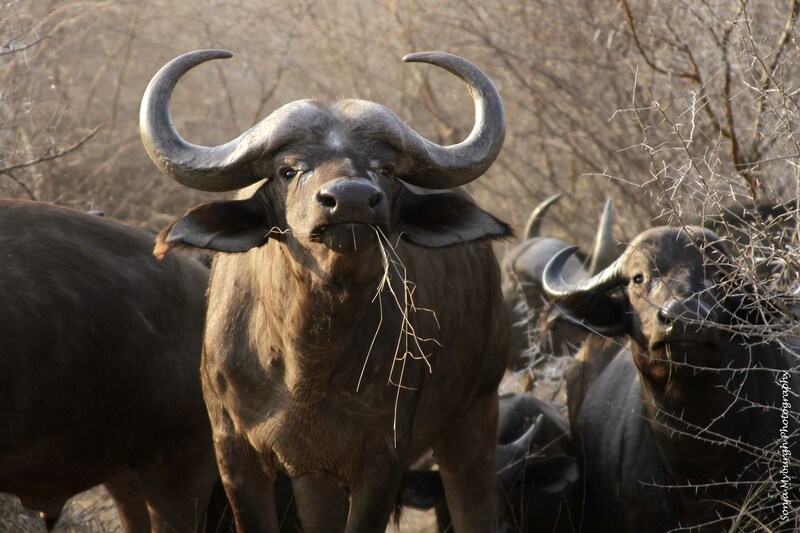 When I was flying home from Johannesburg, the woman in the seat next to me said she wasn’t very interested in game reserves: “I’ve always felt that I could see them in zoos,” she commented. She was not trying to diminish my experience—she was a thoughtful person with whom I enjoyed a long and interesting conversation—but I knew without a doubt that on this particular subject, she was missing something important. How could she possibly understand the way I felt when I saw my first elephant? That occurred on the night drive we took, a tour at dusk in one of the park’s big open-sided vehicles, driven by a very knowledgeable and entertaining guide. The light was starting to dim as we drove through the dry, monochromatic savannah. 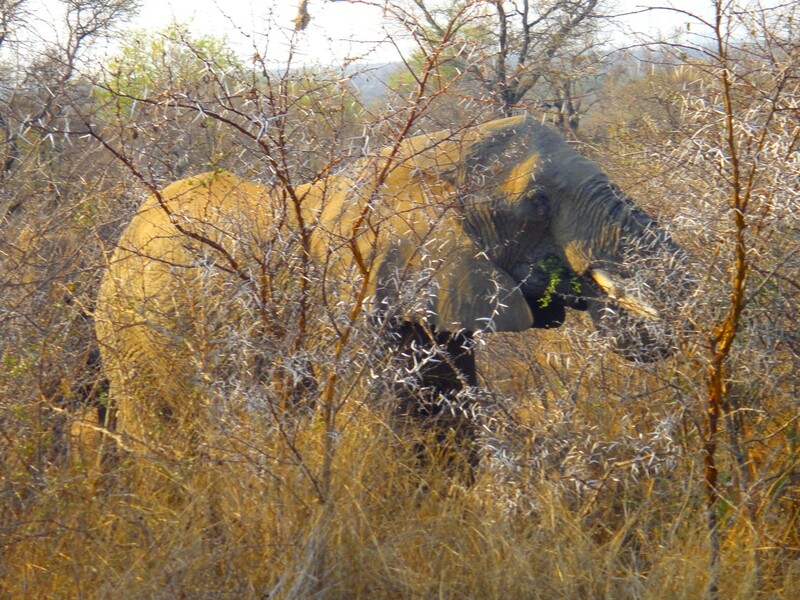 Then someone called out, “Elephant!” And there it was, just a few feet away, a huge gray beast calmly pulling down the leaves from a thorn tree. I could look into its eye. It was looking back at me! And it was in its own home, nearly hidden away, a somewhat drab-colored piece in a huge and complicated jigsaw puzzle, blending in beautifully with the background. 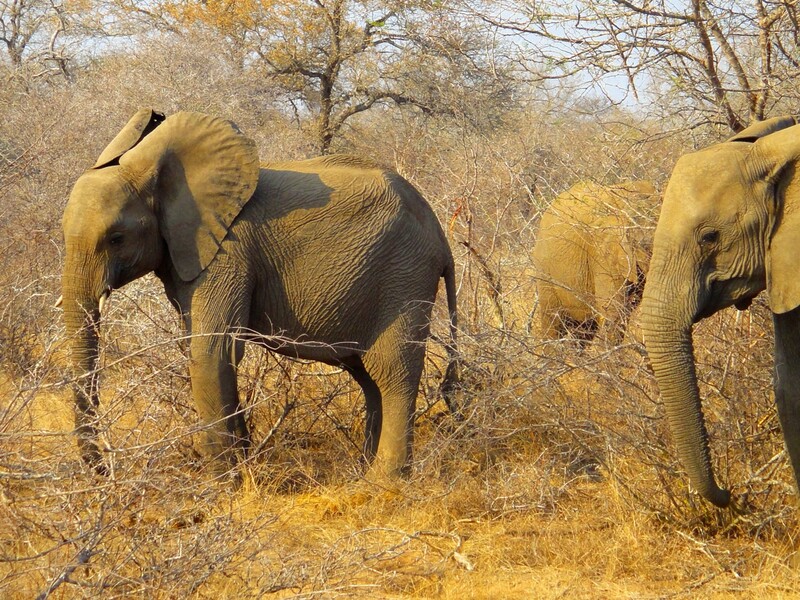 Even the next day, in daylight, the elephants blended in awfully well. 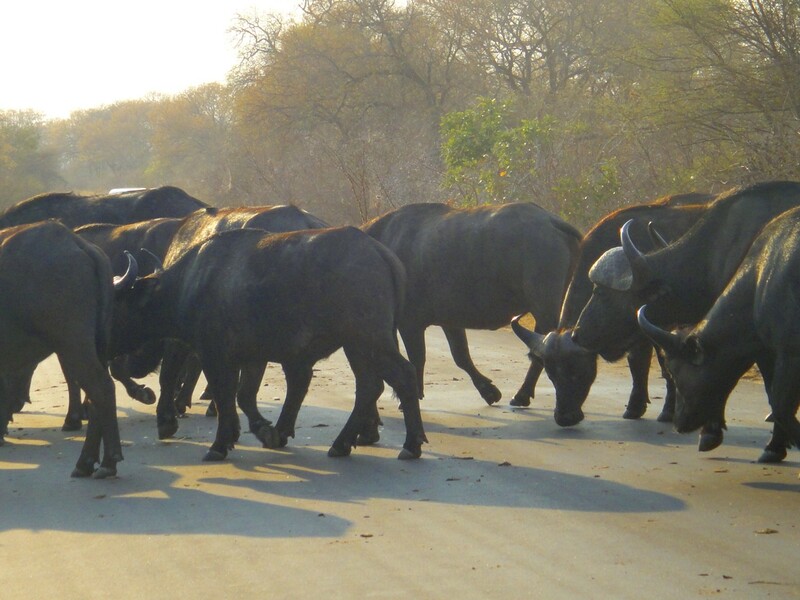 It was fun to see them among the trees, and it was also fun to see them creating a traffic jam. I enjoyed picking out those remarkable shapes in the distance. 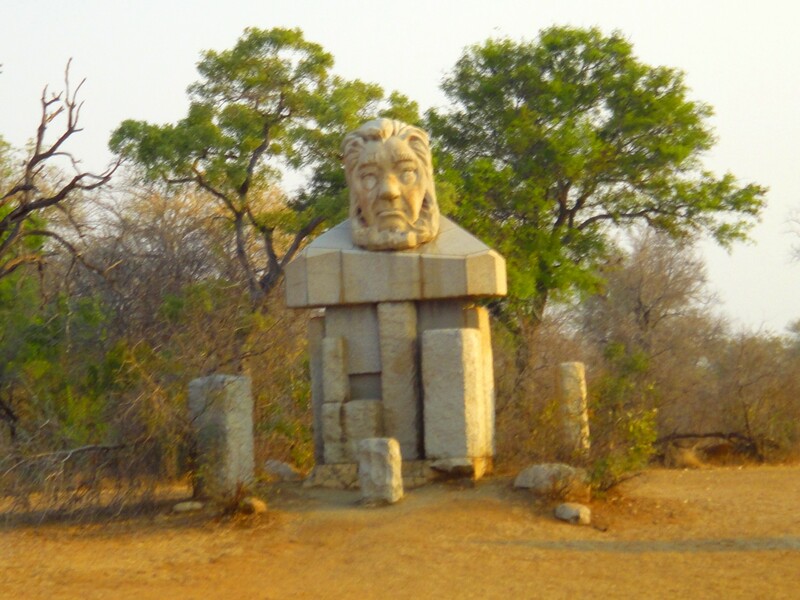 And…very strange to think that it was a certain ugly, irascible man, a certain president of the Transvaal Republic, who had the foresight to set aside a huge area as a game preserve…to actually protect it from his fellow Boers, who loved more than anything else to hunt…to begin what would eventually become, after various stages, the crown jewel of South Africa and one of the most famous parks in the world.